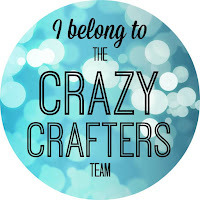 Welcome to the Crazy Crafters Blog Hop for October. This month we are excited to show off some amazing fun folds. We hope you find great inspiration from the projects. You may just be starting the blog hop here at my blog - Stephanie Fischer, The Crafty Thinker - or you may have come from the person before me in the list. If you get off track at any time, the full lineup below will help you to move along from blog to blog so that you see all of the projects. At the moment you are visiting Stephanie Fischer, The Crafty Thinker. I'm a bit in love with easel cards at the moment! They're so easy but effective and they make a nice display for the lucky recipient of the card. There are many good tutorials available for easel cards and I don't really know to whom I should give credit for this great fun fold but, whoever you are, thank you! The colours in this easel card are Smoky Slate, Elegant Eggplant and Wisteria Wonder. 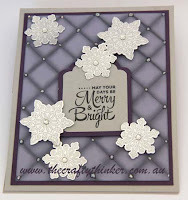 For the snowflakes I used the Flurry of Wishes stamp set (from the Holiday Catalogue), stamping with Versamark onto Silver Foil and heat embossing with Silver Embossing Powder before punching out with the matching Snow Flurry Punch. 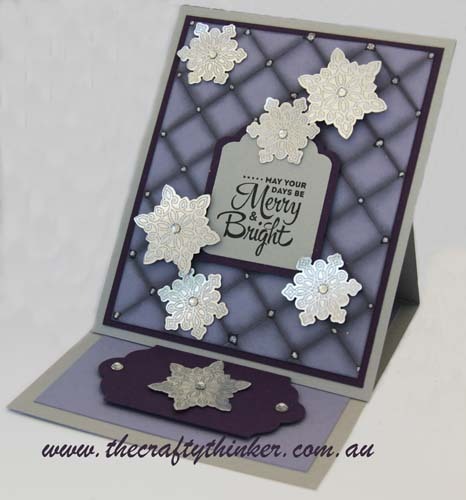 I then used Dimensionals to adhere them to the card and placed a Rhinestone Jewel in the centre of each one. The greeting is from the Lots of Joy stamp set (in the Annual Catalogue), which I stamped onto Smoky Slate card and cut out with the Tags & Labels Framelits. I added a layer of Elegant Eggplant cut with a larger Tags & Labels framelit and placed it onto the card front with dimensionals. To create the Elegant Eggplant label that supports the easel, I cut a rectangle and then made decorative ends using the Tags & Labels framelits and the method I described in this blog post. I'd like to thank Sheri Pearson at Inkspirations for the inspiration and technique tutorial for the pillow top panel. Click here to see her tutorial. Following Sheri's tutorial, I scored the pattern onto the Wisteria Wonder cardstock. Then I folded each score line and inked both sides of the fold with Wisteria Wonder ink. I layered this decorative panel on to Elegant Eggplant before adding it to my Smoky Slate Easel front. Once all my elements were in place, I added a dab of Dazzling Details to each intersection of the lines. I was rushing a bit and didn't do a very neat job but it doesn't seem to matter as much as I feared it would. I'll do better next time! I hope you've enjoyed this card and welcome your comments. Thanks for taking part in our blog hop. Remember that currently you are at my blog - Stephanie Fischer - so check the blog hop line up list to see who is next in the list and click on their name as you don't want to miss out on seeing any of the blogs and the amazing inspiration they contain. I love easel cards and you have done an amazing job with this one. Love, love, love it! Thanks Rosalie. I was a bit worried about entering such a simple card into this Blog Hop but quick and simple was a necessity! Thanks Sue - when I saw what Sheri Pearson had created I had to give it a go too! Easel cards are so good! Great colour combination-thanks for the tutorial on the background-very effective. Thanks Lisa - it was fun to do! Beautiful, will have to try this! Thanks, have fun with it! I love easel card you've done a pn awesome job! I also love easel cards, well done! Thanks Angela - they're very rewarding aren't they?! How beautiful! I love this easel card. Beautiful card Stephanie - I love the colours! Thank you for your comment, Sara. I love the quilted effect on the vellum, it looks fantastic!